I was recently reading an article Dangerous animals we want to give a hug and I met this asian dog. And seriously I would love to own it. But this little cute puppy attacks humans and eats babies. I couldn't believe it so I went on wikipedia and it confirmed this tragedy. The baby's name is Azaria Chamberlain and was only 2 months when eaten by a dingo. I love puppies more than babies, so no harm done! 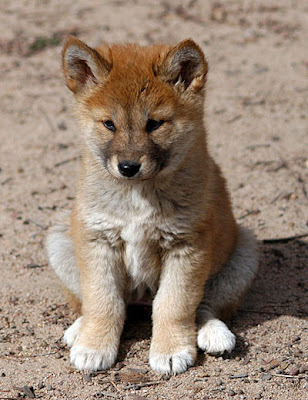 Now, set me straight, THIS PARTICULAR puppy dingo didn't eat the baby, did he? He looks like a baby himself! I'm just saying, rather a cute puppy than a kid anyday...but that's just me! Good thing my dogs don't do that. They are an Australian breed of dog, not Asian. I got bitten on the leg by one when when I was eight. Stupid fucker wanted my sandwich and no way was I sharing.